End-user brands: leisure food, frozen food, meat products, dairy products, pet food, baby food, drinks, daily consumer products, pharmaceuticals, E&E, etc. 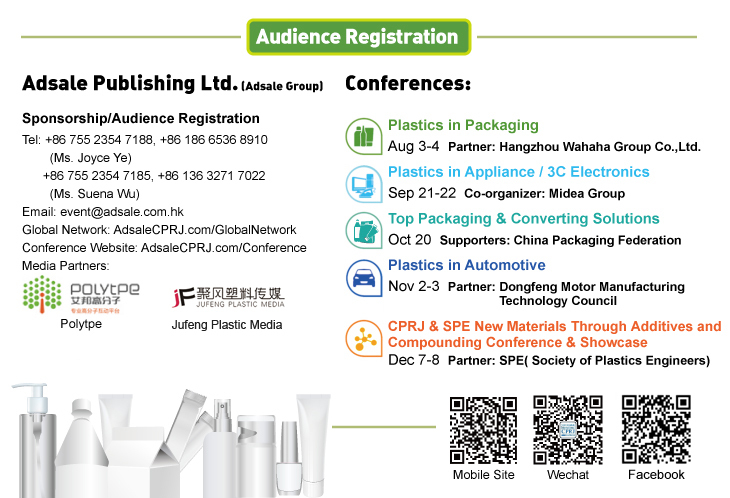 Local and overseas enterprises in Flexible packaging, Rigid packaging, Package printing, Plastics recycling sectors. Experts from the government, industry associations and research institutes. Mondelēz, Want Want Group, General Mills, Starbucks, Sanquan, NESTLE, Pepsico, Yum!, Zhou Hei Ya, Extra, Perfetti, Hershey's, Bright, Yili, President, Unilever Research, Johnson, Procter & Gamble, Philips, Bemis, Amcor Flexibles, Zhejiang Changhai, Jiangsu Caihua, Hangzhou Dingzheng, Huangshan Novel, Tianjin Baode, Shanghai Hengxin, Klockner, Xingtai Beiren, Glades, Rizone, Chuo Kagaku, Printpack, Tianjin Tenghua, Beijing Plascup, Goldstone Packaging, Zijiang, CPMC, etc. Technical Sales Engineer in the company MITUTOYO, leading manufacturer of metrology instruments, after obtaining a specialisation in metrology. Current employment: After joining the Sales Team of COSTRUZIONI MECCANICHE LUIGI BANDERA S.p.A. in 2010, I’ve been focusing on the flat die extrusion technology for the production of thin foil and thick sheet destined for the most varied applications. As a Flat Die Technology Sales Area Manager, I was in charge of the Eastern Europe countries, Turkey and Israel for 7 years. From 2017 I am also in charge of the Chinese area, with the aim to establish and consolidate the Bandera PET extrusion technology into this crucial and challenging market. COLOMBO, leading manufacturer of rotogravure printing machines and embossing machines for the ennobling/finishing of the plastic materials - 1996-2007. Current employment: After joining the Sales Team of COSTRUZIONI MECCANICHE LUIGI BANDERA S.p.A. in 2007, I’ve been focusing on the blown film extrusion technology as Senior Sales Area Manager in charge of the Chinese, Russian and Egyptian markets. In 2008 I could contribute to the establishment of the Bandera China and Middle East Representative Office. John began his career with Cloeren in 1986 after graduating from Lamar University. For the first several years he worked in various Engineering positions including designer and project manager. He was promoted to a Technical Sales Engineer position in the mid-90’s and after serving in a variety of sales and marketing positions, eventually became Global Sales Director. John has travelled the World extensively over his career and has been an instrumental contributor to building the Global brand Cloeren represents today. With over 25 years of experience with Cloeren, John Chalmers is currently positioned as Vice President of Sales. Expert for fluid- and powder coating systems for plastic film, nonwoven and paper applications. Long lasting experience in functionalising of surfaces in the film and packaging industry. Available for international application consulting and innovative advancement. Mr. Oliver Pace graduated in Mechanical Engineering in 1994. Has been working as Area Sales Manager (Asia) since 2001. The first 8 years with Bonfiglioli Engineering in the packaging machinery, and then with Doteco in the extrusion machinery field. Andrea Crespi has graduated with a Master Degree in Mechanical Engineering at Milano Politecnico University. Crespi has worked for twenty years in international sales in the field of thermoforming machines and extrusion lines for rigid food packaging application, developing furthermore his technical expertise. He is now the sales responsible in charge of Asia, UAE and Saudi Arabia market for WM Thermoforming Machines, based in Stabio, Switzerland. Sven Conrad has served the plastics industry for almost 25 years. Sven joined Kreyenborg (now part of Nordson Corporation’s Polymer Processing Systems line of business) in 2000 as project sales manager acting worldwide with special responsibility for parts of the Asian market. After the acquisition of Kreyenborg GmbH and BKG GmbH by Nordson Corporation, based in Westlake, Ohio in September 2013 he took over the global sales responsibility for Nordson PPS GmbH and Nordson BKG GmbH. In January 2015 he was appointed Global Business Director for the Melt Delivery Business Unit in Nordson’s Polymer Processing Systems (melt filtration, pumps, valves and ovens). After earning his Bachelor and Masters degrees in Computer Engineering from the University of Padova (Italy) Mario Bardini began working in the telecommunications sector with several Italian companies. In 2015, Mario joined the Moretto Group in the position of Sales Area Manager for Contrex S.r.l., a Moretto Group company, which specializes in the manufacturing and sale of systems solutions for the extrusion industry. Mario is fluent in both English and Spanish and is based at Moretto’s global headquarters in Massanzago, Italy. Degree in energetic engineering at the University ”Politecnico di Milano” in 2014. In the same year he joint Sorema div. of Previero as assistant to Commercial Department in Chinese markets. The daily activity spread from the support in after sales services and lines start‐up. Wu Hongjun is the Deputy Secretary General of China Packaging Federation. He is also the Secretary General of National Packaging Vocational Training Steering Committee of Ministry of Education as well as Planning Committee of China Packaging Federation. He is responsible for the training, planning, Chinese Packaging Excellent Brands, industry coordination at these organizations. He led the drafting works of national key initiatives and development roadmap for Chinese packaging industry in 2015. Zhong Yu was graduated from Changshu Institute of Technology, majoring in Applied Biology. He received his EMBA degree from Peking University. 1. 7.1998 – 3.2001 Quality Control, Nantong Huaying Aquatic Product Co., Ltd.
2. 3.2001 – 10.2002 Application, Research and Design of New Processing, China Yurun Food Group Co., Ltd.
3. 10. 2002 – 10.2011 General Manager, Central Emporium (Group) Co., Ltd.
4. 10.2011 – 8.2016 General Manager, Technology Department, Lian Life Insurance Co., Ltd.
William Yang, Assistant of General Manager, Sunrise Packaging Material (Jiangyin) Co.,Ltd. William Yang was graduated from Jiangnan University, and has ten years of working experience in packaging industry. He is the Manager of R&D and the General Manager Assistant at Sunrise Packaging Material (Jiangyin) Co.,Ltd.. He is also the Deputy Secretary-General of Packaging Committee of Chinese Meat Association. William Yang was in charge of 4 national research projects and over 20 company’s projects for Sunrise Packaging Material (Jiangyin) Co.,Ltd., and achieved fruitful results. He received over 10 awards from the company, local governments and industry organizations. He was also granted 36 patents, and involved in drafting of national standards. In addition, he published over 10 professional papers in different publications. Yang Fuxin is the Professor of Collage of Food Sciences and Technology, Shanghai Ocean University. He is also the Deputy Director of China Packaging Education Committee. His research focuses on packaging engineering, new packaging materials, food packaging processes and fresh packaging technologies. For more information on guests, please pay attention to CPRJ public number!